Ready to start helping your students succeed? Start here! It's never been easier to find great activities! Just type in a keyword and use filters such as "educational standards" or "grade level" to find activities that fit your search request. Once you find the perfect activity to supplement your lesson, just download it to your Boardmaker Software to print or play. Collaborate with AT Specialists, SLPs, autism experts, special education teachers, and parents. Share best practices and activities related to common topics and interests. You can even start your own group! Thanks to community members, like yourself, there are over 20,000 activities to choose from... and the number keeps growing! Upload your own, and download new ones. It's all about sharing. 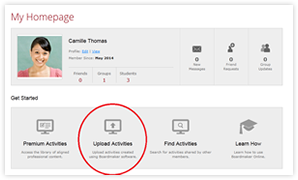 You can even upload the boards and activities that you've already created and align them to academic standards! Click on the Help menu to access the User's Guide, how-to videos and tutorials. 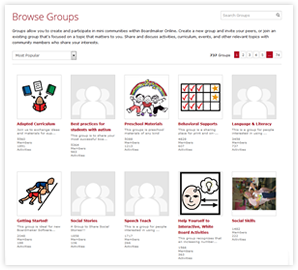 Use the Community Forums to ask a question, share an idea, report a problem or give praise. 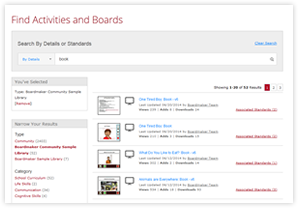 Interested in taking your Boardmaker Online Community subscription to the next level? Want to be able to access Boardmaker on the iPad, assign specific activities to specific students, track your students' usage, and so much more? Click here to start your free trial.